He was such a great man. Friend of theologian RC Sproul in college, incidentally. I always thought he was creepy. I never wanted my children to watch him. Cheech and Chong got it right. 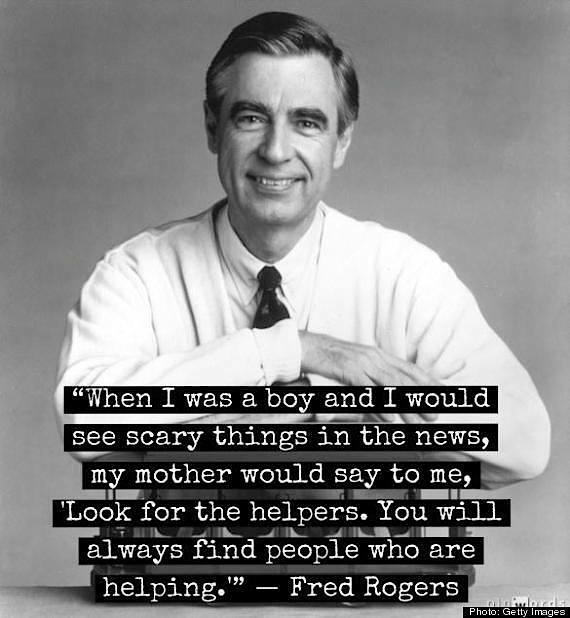 Love Mr Rogers. My culturally deprived kids got no TV when young except him or wild animal documentaries. Civilization vs reality. All respect to gentle Fred but I think the correct response is to open up a can of whoopass on the perpetrators of this outrage. Nowadays, the acolytes of the PBS liturgy and magisterium are helpless. Perpetual children, they are dependent upon the political class for everything from A-Z, and the number of the day is 17 trillion. Bill, you're right, but the injured must be helped first. Then crush the perps like the cockroaches that they are. Even Fred would have understood that. Helpers worth knowing about: Carlos Arredondo, Natalie Stavas, among many. And a good blog post from a Boston marathoner and father of four: What I told my son the night after the 2013 Boston Marathon. "Evil is not a thing, it’s a lack of a thing. It’s a void where the relationship between God and something, someone, in the world ought to be. We can fill that space, leave no room for evil. I would not necessarily have run Boston again next year. There are other marathons to explore in the limited time we have. But now I know I’ll register. I told David that: I’m registering for this race next year. Let’s not be afraid. Lets fill the world with life and be damn well defiant about it." He always made me uncomfortable, as much of everything on PBS does anymore. I heard a story once, don't know that it's true, of him behaving in a very un-Mr.Rogers manner one day. No longer a progressive fellow-traveler, and after years of seeing the sheep clothes pulled back, I tend to think it may just be valid. If you read the comments on the "Jumped the Shark" site you would see a similar schism there also: some thought he was great and others thought he was creepy. No fence sitters. To me he seemed more affected than naturally warm and compassionate.